Most people often feel uncomfortable when they feel like the demands or pressures on them are more than what they can cope with. This includes its share of stressors and demands, ranging from family, work, and professional role responsibilities to major life events such as divorce, illness, and the death of loved ones. Everybody feels stressed at times. However, the way one responds to such stressors depends in part on the person’s coping resources. Considering healthy ways to cope and getting the appropriate care and support can put problems in perspective and help stressful feelings and symptoms subside. Nurses, together with the patients, need to recognize stress accordingly to come up with the most effective yet proper strategies that work best for every patient. Patient communicates needs and negotiates with others to meet needs. Patient describes and initiates effective coping strategies. Patient describes positive results from new behaviors. Patient focuses on the present. Patient identifies personal strengths and accepts support through the nursing relationship. Patient makes decisions and follows through with appropriate actions to change provocative situations in the personal environment. Patient uses available resources and support systems. Patient verbalizes feelings related to emotional state. 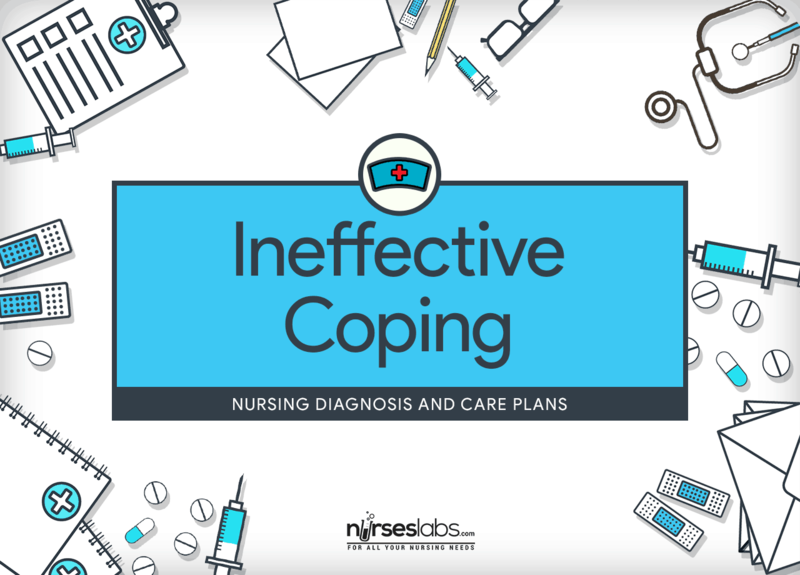 Assessment is required in order to distinguish possible problems that may have lead to Ineffective Coping as well as name any episode that may happen during nursing care. Assess for the presence of defining characteristics. Behavioral and physiological responses to stress can be varied and provide clues to the level of coping difficulty. Assess for the influence of cultural beliefs, norms, and values on the patient’s perceptions of effective coping. The patient’s coping behavior may be based on cultural perceptions of normal and abnormal coping behavior. Observe for causes of ineffective coping such as poor self-concept, grief, lack of problem-solving skills, lack of support, or recent change in life situation. Situational factors must be identified to gain an understanding of the patient’s current situation and to aid patient with coping effectively. Assess for intergenerational family problems that can overwhelm coping abilities. Intergenerational family problems put families at risk of dysfunction. Identify specific stressors. Accurate appraisal can facilitate development of appropriate coping strategies. Because a patient has an altered health status does not mean the coping difficulties he or she exhibits are only (if at all) related to that. Persistent stressors may exhaust the patient’s ability to maintain effective coping. Observe for strengths such as the ability to relate the facts and to acknowledge the source of stressors. Family members who are coping with critical injuries often feel defeated, hopeless, and like a failure; therefore it is necessary to verbally praise them for their strengths and use those strengths to aid functioning. Determine the patient’s understanding of the stressful situation. Patients may believe that the threat is greater than their resources to handle it and feel a loss of control over solving the threat or problem. The patient’s cultural heritage and previous experiences may affect the patient’s understanding of and response to the present situation. This information provides a foundation for planning care and choosing relevant interventions. Analyze past use of coping mechanisms including decision-making and problem-solving. Successful adjustment is influenced by previous coping success. patients with a history of maladaptive coping may need additional resources. Likewise, previously successful coping skills may be inadequate in the present situation. Monitor risk of harming self or others and intervene appropriately. A patient with hopelessness and an inability to problem solve often runs the risk of suicide. Evaluate resources and support systems available to the patient. Patients may have support in a single setting, such as during hospitalization, yet lack sufficient support in the home setting. Assess for suicidal tendencies. Refer for mental health care immediately if indicated. Identify an emergency plan should the patient become suicidal. A suicidal patient is not safe in the home environment unless supported by professional help. Set a working relationship with the patient through continuity of care. An ongoing relationship establishes trust, reduces the feeling of isolation, and may facilitate coping. Assist patient set realistic goals and identify personal skills and knowledge. Involving patients in decision making helps them move toward independence. Provide chances to express concerns, fears, feeling, and expectations. Verbalization of actual or perceived threats can help reduce anxiety and open doors for ongoing communication. Use empathetic communication. Acknowledging and empathizing creates a supportive environment that enhances coping. Convey feelings of acceptance and understanding. Avoid false reassurances. An honest relationship facilitates problem-solving and successful coping. False reassurances are never helpful to the patient and only may serve to relieve the discomfort of the care provider. Encourage patient to make choices and participate in planning of care and scheduled activities. Participation gives a feeling of control and increases self-esteem. Encourage the patient to recognize his or her own strengths and abilities. During crises, patients may not be able to recognize their strengths. Fostering awareness can expedite use of these strengths. Consider mental and physical activities within the patient’s ability (e.g., reading, television, outings, movies, radio, crafts, exercise, sports, games, dinners out, and social gatherings). Interventions that improve body awareness such as exercise, proper nutrition, and muscular relaxation may be helpful for treating anxiety and depression. Assist patients with accurately evaluating the situation and their own accomplishments. It can be helpful for the patient to recognize that he or she has the skills and reserves of strength to effectively manage the situation. The patient may need help coming to a realistic perspective of the situation. If the patient is physically capable, encourage moderate aerobic exercise. Aerobic exercise improves one’s ability to cope with acute stress. Provide information the patient wants and needs. Do not give more than the patient can handle. Patients who are coping ineffectively have reduced ability to absorb information and may need more guidance initially. Provide touch therapy with permission. Give patient a back massage using slow, rhythmic stroking with hands. Use a rate of 60 strokes a minute for 3 minutes on 2-inch wide areas on both sides of the spinous process from the crown to the sacral area. A soothing touch can reveal acceptance and empathy. Slow stroke back massage decreased heart rate, decreased systolic and diastolic blood pressure, and increased skin temperature at significant levels. The conclusion is that relaxation is induced by slow stroke back massage. Assist the patient with problem-solving in a constructive manner. Constructive problem solving can promote independence and sense of autonomy. Provide information and explanation regarding care before care is given. In traumatic situations, families have a need for information and explanations. Providing information prepares the patient and family for understanding the situation and possible outcomes. Eliminate stimuli in an environment that could be misinterpreted as threatening. The presence of noise associated with medical equipment can increase anxiety and make coping more challenging. Discuss changes with patient before making them. Communication with the medical staff provides patients and families with understanding of the medical condition. Provide outlets that foster feelings of personal achievement and self-esteem. Opportunities to role-play or rehearse appropriate actions can increase confidence for behavior in actual situations. Point out signs of positive progress or change. Patients who are coping ineffectively may not be able to assess their progress toward effective coping. Encourage use of cognitive behavioral relaxation (e.g., music therapy, guided imagery). Relaxation techniques, desensitization, and guided imagery can help patients cope, increase their sense of control, and allay anxiety. Be supportive of coping behaviors; give patient time to relax. A supportive presence creates a supportive environment to enhance coping. Discuss with patient about his or her previous stressors and the coping mechanisms used. Describing previous experiences strengthens effective coping and helps eliminate ineffective coping mechanisms. Use distraction techniques during procedures that cause patient to be fearful. Distraction is used to direct attention toward a pleasurable experience and block the attention of the feared procedure. Apply systematic desensitization when introducing new people, places, or procedures that may cause fear and altered coping. Fear of new things diminishes with repeated exposure. Refer for counseling as necessary. Arranging for referral assists the patient in working with the system, and resource use helps to develop problem-solving and coping skills. Refer to medical social services for evaluation and counseling. This will promote adequate coping as part of the medical plan of care. If the patient is associated with the mental health system, actively engage in mental health team planning. Based on knowledge of the home and family, home care nurses can often advocate for patients. These nurses are often requested to monitor medications and therefore need to know the plan of care.